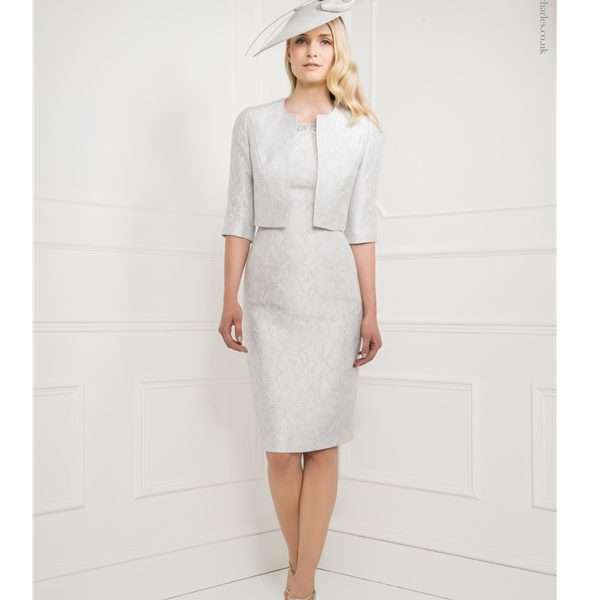 John Charles 25849a platinum mother of the bride or groom dress and cropped jacket. In brocade fabric with beaded detail on neckline and cap sleeves. John Charles 25849A beautiful platinum coloured dress and jacket in brocade detail fabric. Features mesh capped sleeves and beaded neckline. The Jacket is matching fabric with 3/4 sleeves and cropped edge to edge fit. This wedding outfit is in the perfect neutral colour to blend in with any brides colour choices. The simplicity of the design and shape allows understated glamour and the intricate beading on the neckline and sleeves add that feminine touch.